Isoseismal map of the Cape Farewell earthquake. Courtesy Atlas of isoseismal maps of New Zealand earthquakes (2nd edition): Downes, G.L. ; Dowrick, D.J. 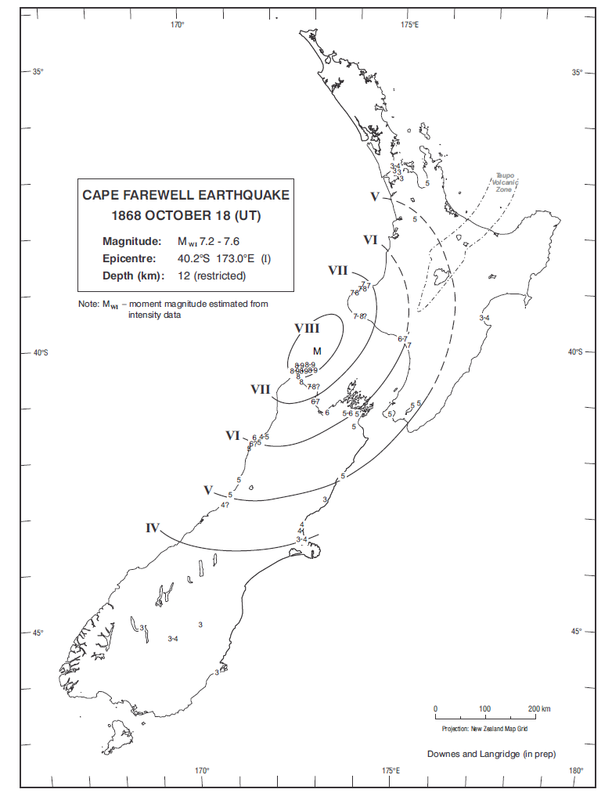 This earthquake was located to the north of Farewell Spit. From the Collingwood, Pakawau, and Farewell Spit area there were reports of conspicuous and extensive ground cracking as well as damage to houses. A contemporary description of surface ruptures and slips in the area may implicate the Wakamarama Fault in this quake and also describes over 100 events over the next 10 days, at least one of which toppled chimneys previously damaged. At least 10 of the aftershocks were also distinctly felt in Hokitika, Nelson, Wellington, Whanganui, and New Plymouth1.